A classics professor once told his class in my presence that there no longer existed the possibility of the creation of an American national epic poem, something like the Iliad, Aeneid, the "Divine Comedy," "John Brown's Body," etc., because the declining cultural level and the lack of common values among the "American people" had destroyed the basis of wide comprehension and acceptance that would be needed for such an effort. That was fifty years ago. What would he think now? Poetry - any kind, whether epic or not - depends upon a spoken culture, whether literate or not. Very few of us today sit around in groups talking to each other, except at business meetings. Perhaps because of TV, or the automobile, or both (internet makes it worse but this began happening much earlier during radio era) - we no longer sit around and gossip to pass the time with our friends and relations. Therefore we no longer sit around and recite poetry. In Lebanon (and Peru, Greece, and many other traditional societies, by report) people were still sitting around and talking within my memory, and I'm 45. This casual gossip sometimes led to poetry competitions. Some poems were self-composed and of low-medium quality; often they were poems, ancient or contemporary, by great poets. Simple country people would memorize sections of epic national poetry to recite for the amusement of their friends and relations. Men (and women - see Lila Abu-Lughod's research on Bedouin women's poetry) competed with each other to recite poems, their own or others', which would move or impress or amaze. Nowadays in Lebanon at least, the TV is always turned on, and it's the size of the living room wall, so idle chatter and spontaneous verse are drowned out by CNN or LBC. My dad wrote Arabic poetry as an avocation. * I was always impressed at how the silliest, most materialistic Lebanese housewife would listen to his poetry with attention and offer intelligent comment. The fact that he wrote and recited poems made him worthy of attention and respect, and even people I thought were uneducated and uninterested in culture became alert and happy if Dad decided to recite. Whereas we Americans, including his ungrateful children, thought the whole business embarrassing. Did Applachian mountain people recite poetry to each other? I don't know, but they sang each other songs, which are *lyrics*. I don't know about the Irish either but they have such a gift for gab and verse that I assume there must have been an Irish tradition of popular poetry. Today the poetry slam has become popular among younger folk. People get together at a cafe or auditorium and read or recite their poems aloud, usually with lots of emphasis and pizazz, looking to wow the crowd. Whatever you may think of the poems arising from this movement, at least it's popular and it's poetry and it's face to face. I believe a poem spoken aloud has greater power when heard in the presence of the speaker - the breath is spirit you know. Recordings give you a flavor but nothing beats being in a room with other human beings, listening to a poet (preferably acoustic, unmiked) recite. When the oil runs out and we have to turn to homemade amusements, we have a better chance of developing some national epic poem or another. Maybe in the future an anonymous Lebanese-Irish-Japanese-African-American bard in the camps of California will compose an epic poem about the wars of Iraq and Iran and the bloody trials of Americans therein. (end comment). *The poem reproduced here was written in casual, dialect Arabic. I doubt my Dad would want it to stand for all of his work, but it's the only Arabic poem I have of his scanned into a JPEG file. He cared about classical Arabic very much and was careful to write with clarity and formality. He also spoke Lebanese dialect with care in casual conversation, eschewing elisions and foreign words, and enunciating clearly. 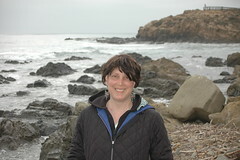 Yesterday at Cambria, near the sea lion nursery. Breaking radio silence here to report that we're on vacation. It's a "staycation" - we're not leaving the state. In fact we're driving no farther than 200 miles from our home. Tonight we're in Seaside, CA, a suburb of Monterey, staying at a hotel plopped on the Monterey State Beach. It's a travesty of 70s development but it's also a great deal and you can't imagine how nice it is to sit in the lobby looking at the sea through the plate glass. The weather is chilly here! Earlier we walked at Carmel River State Beach and looked at the ocean, then drove around to Carmel's main town beach and lay about in the shelter of a sand dune. Yes, the picture above was taken today, June 26, in Carmel, and yes we were indeed wearing our winter parkas and glad of it. The tourists shivered in their shorts, and the stoic Northern Californians walked around in hoodies and capri pants, but I have to stay warm so I was all bundled up. The temperature was around 60 Fahrenheit but the wind blew stiff off the ocean. We ate at the Ol’ Factory Cafe in Seaside - sustainable food, fair trade coffee, organic french fries & deep fried artichoke hearts. They served chilled tap water in recycled European beer bottles with stopper-caps. Nice touch. I have indeed been working on my novel. Some of my readers have caught me commenting at other blog sites and told me to get back to work. Busted! 275 pages and I'm ahead of my "schedule" - the list of tasks to do on the book to get it to a decent draft. Last night my writing group (minus several beloveds - hi Caro, Sara, Jinky & Allison) patted me on the back and listened to me while I kvetched a little about the book. They think I ought to be proud of writing 275 pages, even though it's a big mess. All novels are a big mess at this stage. "People say it sounds like Kite Runner. Maybe it is like Kite Runner, and that book is so ...." I said. (dismissive comment deleted). Somehow if my book were like Kite Runner but Lebanese, that wouldn't be okay with me. But I'm in a tired and fussy mood about reading, and everything I pick up seems not good enough, except maybe Chekhov. "I really liked Kite Runner" Scott said. He has fabulous taste so I ought to listen to him and quit ragging on myself. If you are interested in the genre, my friend Mahmud Rahman wrote an essay on the return novel that mostly looks like the form of my book, with some differences. Current working title: The American Cousin. Back to the vacation. Tomorrow we drive to Cambria, planning to visit Hearst Castle on Saturday, then return to Oakland by Sunday. I *hope* to do a little writing while on the road. Since I'm five days ahead of my schedule, I have some leeway. A blog with a readership is like crack cocaine for a procrastinating writer like me. I can post something here (or in comments elsewhere) and go look at my referral stats. 400 hits today! Colin linked to me, 600 hits! Woo hoo! I can think of something or another, slap it up, and get an instant response. I can write a longer essay and get comments and links to other people's essays. Meanwhile I cry to my husband that I'm not finishing my novel, and what if I die without publishing it or any of the short stories I've got lying around that are "almost there." Today Erik Peper said - maybe you like blogging. Maybe that's the writing you are here to do. If I die without finishing this novel I will be so mad, I said. I don't want to leave a bunch of manuscripts and diaries in bankers boxes for somebody to put in recycling one day (far from now we hope). No writer ever feels like she's written everything she wanted to, Peper said. What turns you on to do today? I loved reading the first chapter aloud to cousin N when she was here. I love writing when it goes well, I like messing with the draft bits to get them better. I love reading stuff aloud and I sure do like it when I get things published (although it's so anti-climactic, and I tend not to look at my published work at all.) Reading on the radio last year felt like my true calling - working with the producer to edit the story for fluency and readability, then doing the takes until we got it right. So I made a contract with Erik, which I've sent to him and to my writing buddy S. I am also going to be sending in my weekly writing goals to S, who is working on her own big novel while juggling family life. I'll be calling cousin N to see if she wants to listen to some of the work over the phone. And I'm really, truly signing off of Dove's Eye View, at least until the end of the summer. I have a second draft deadline and I have got lots of work to do! Thanks everybody for being such true-blue readers. You have my permission to harass me if I log on again before August 25. If you're wondering how I'm doing physically, email me. Oh I reserve the right to post good news about my health if I feel so inclined. Always a back door, huh? The most frightening question is this: if democracy makes a black man a mainstream American, can it also make an Arab a mainstream Israeli? He's trying to explain Obama's AIPAC speech. My mother warned me about Barack.... I have to say that few Arab-lovers have voted for a mainstream US presidential candidate with a happy heart. Looks like Barack can't change this equation, this time. We liberal Arab-Americans who support Obama may be the mirror of my Lebanese-American cousins who supported Bush II (you know who you are, guys!). They thought Bush was secretly pro-Arab and would play fair with the Palestinians. I've heard some Obama supporters say the same of Barack. I am staying out of it - none of us knows how Barack might maneuver the Israel/Palestine conflict. (I think that's why AIPAC and other ultra-right-wing Jews are so nervous - they aren't sure he'll behave like Bush II, or Joe Lieberman, or Joe's dear friend Hillary Clinton). But I like Avishai's question. The gently sarcastic query is a rhetorical mode I favor. P.S., yes I said it, I'm an Arab-lover. Since I am an Arab, as are all of my paternal relatives, why are you surprised? Kucinich introduces Bush impeachment resolution - Ohio Politics Blog by The Plain Dealer. Cleveland Democratic Rep. Dennis Kucinich took to the House of Representatives floor on Monday evening to introduce a 35-count resolution to impeach President George W. Bush. Kucinich claimed Bush "fraudulently" justified the war on Iraq and misled "the American people and members of Congress to believe Iraq possessed weapons of mass destruction so as to manufacture a false case for war." "President George W. Bush, by such conduct, is guilty of an impeachable offense warranting removal from office," Kucinich said. My internet buddy Jadepark posts this question: Why aren't you blogging? at Writing Under a Pseudonym. She's talking about herself, but I am going to pile on. When I go silent for a week, my faraway friends and relatives worry about me. Don't worry. Chemo is going well. My blood work looked great last week; I have decent energy. A friend came from New York for the weekend and I whooped it up with her (a relative term - just ran around quite a bit during the day on Friday and a little on Saturday and Sunday). I've had the energy to play with my kids, take them to school, cook a meal, clean out some clutter, and more. I should be writing now, not blogging. OK folks. I am fine. Just not blogging! PS: Lebanese Green Beans with Olive Oil, Garlic and Tomatoes for dinner tonight. I just had lunch with my dear friend from graduate school at Mills College, Carolina De Robertis, who has huge news: Baron Gets Big Debut - Publishers Weekly. We read an earlier draft of this novel in our first year novel workshop (three or four people from that workshop are in our writing group today - hello Reed, Caro, Jinky). Carolina arrived at Mills with a completed draft, which she proceeded to revise over the next two and a half years, while writing all new material for her thesis, new work for literary quarterlies, and earning a living. I am over the moon... Invisible Mountain will be published in another eighteen months or so, and I look forward to reading it and sharing it with the blogosphere when the time comes. Today I want to brag about my comadre Carolina, and the amazing group of writers and teachers who are part of our milieu. Carolina has big talent, a big heart, and a tremendous work ethic. She's also a great teacher...remember this name! With Micheline Aharonian Marcom (left), our inspiration. 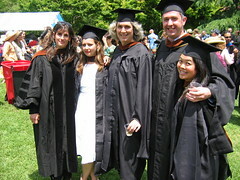 From left: Micheline, Carolina De Robertis, me, Will Lynch, and Alison Towata. Since I'm bragging about Mills and our posse, let me tell about Laleh Khadivi. She's too independent to be part of OUR posse but she was our esteemed colleague at Mills, a student of Micheline Marcom's as well, and we were honored to hear passages from her debut novel, Age of Orphans, when the paper was still hot out of the laserjet. The book was sold to Houghton as part of a two-book deal in October, 2007, and will come out in early 2009. The passages I have read make me yearn to read the whole thing. Another big talent. Bill Clinton's campaign team in 1992 famously posted a slogan during their momentous election: It's the economy, stupid. Most pundits agree that Clinton beat a formerly popular sitting president because Americans were worried about the economy, and the Democratic candidate ran strongly on that issue. Now Frank Rich tells us it's the Iraq war, stupid: McCain's McClellan Nightmare - NYTimes.com. Mr. Bush, Mr. McCain and Mrs. Clinton refuse to accept responsibility for their roles, major and minor, in abetting this national tragedy. Hilary Clinton never had my vote because of her stance on Iraq. She wouldn't even admit that her judgment was wrong - in fact she has called for "obliterating Iran" next, if that country does not do our bidding. Obama's Middle East stance caters to the Joe Lieberman crowd as cravenly as Hilary's, but at least he was right about Iraq from the beginning. Now it seems that a plurality of American voters share my concerns. Even folks who believed in the war now get it.